Ellis Ward was born the youngest son of Isaac Ward and his wife Winifred on September 13, 1846, at Newbury-on-Hudson in New York’s Hudson River Valley. Ellis Ward and his eight brothers rowed regularly in the Hudson River’s Newburgh Bay from the 1850s through the 1870s and became one of the most famous families in the history of the sport of rowing. His life illustrates many aspects of rowing as it was developing in America during the nineteenth century. Here along the Hudson River, rowboats were used as transportation, even as ferries, throughout the nineteenth century. During these early days of the sport of rowing in America, rowing clubs sprung up in towns like Newburgh and Poughkeepsie as early as the 1830s. For several decades, semiprofessional races of skilled oarsmen, with cash prizes awarded to the winners, drew large crowds and considerable betting. These races were discontinued in the early 1870s, after incidents such as a disputed 1865 race in Poughkeepsie that ended with a rampaging mob and the death of a spectator. As professional racing declined, college rowing became more prominent. It was in this environment that Ellis Ward came of age. Ellis Ward grew up in a large family of rowing enthusiasts. The 1850 census listed 55 year old Isaac Ward as living with his wife and ten of his children; his sons Charles (age 20), George (age 18), and Benjamin (age 16) were described as “boatmen.” Gilbert was only eight years old and Ellis just four years old at the time, and two older boys, William Henry “Hank” and Joshua (probably born 1838), did not appear as part of the household. Although Isaac was described as a laborer in 1850, ten years later the census listed him as a fisherman, with real estate valued at $1,000; in 1860 he lived with his wife and four of his children. Gilbert, then 18, was now a boatman. Ellis, the youngest, was just thirteen. 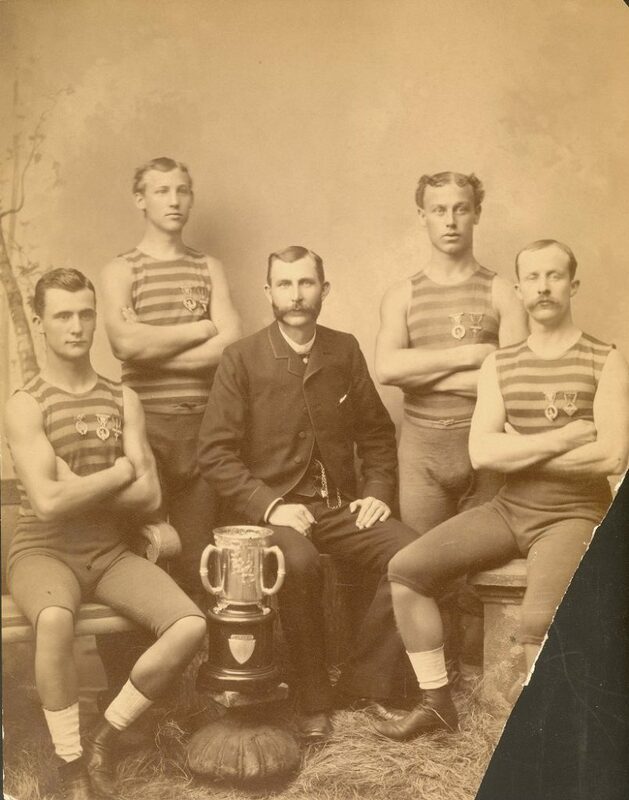 By 1860, Ellis Ward’s older brothers were already competing as semiprofessional rowers. “Josh” Ward won many singles titles, including the U.S. professional single sculls title on October 11, 1859, and set world records which still stand to this day. Ellis took up competitive racing at age 17, participating in a “boys” race at Cornwall-on-the-Hudson. Soon he joined three of his brothers (Ellis, Henry, Josh, and Gilbert) to race as a team; their many wins included the 1865 professional four-oared championship of America and a world title in 1871 at Saratoga. Newspapers from the 1860s and 1870s contained numerous accounts of races rowed by the Ward brothers either singly or as a crew. All four brothers are in the Rowing Hall of Fame. The Ward brothers earned prize money for their efforts. In 1875 Josh Ward participated in a four-oar race held in New York City between an English and an American crew. The winning crew won $5,000 and the title of world champions. The race’s sponsor Bernard Biglin selected Josh and William Henry “Hank” Ward, along with John Biglin and Thomas Elliott, for the American crew. In 1880 Ellis Ward lost a single scull race in Philadelphia and a prize of $300; the National Police Gazette of November 6, 1880, reported that New Brunswick rower R. J. Nagle came in first on the three-mile course. Despite their racing successes, the Ward brothers needed additional sources of income. Ellis Ward was not only a racer, he was also a successful coach, an expert builder and rigger of shells, and maker of oars. With his first foray into college coaching at Amherst in 1873, Ellis Ward was following in the footsteps of his older brother Joshua. According to articles in the August 28, 1869, Saturday Evening Post and the July 29, 1871, Massachusetts Ploughman and New England Journal of Agriculture, Josh Ward was trainer of the Yale crew in 1869 and of the Amherst crew in 1871. By 1880 Joshua Ward ran a hotel in Cornwall, New York. 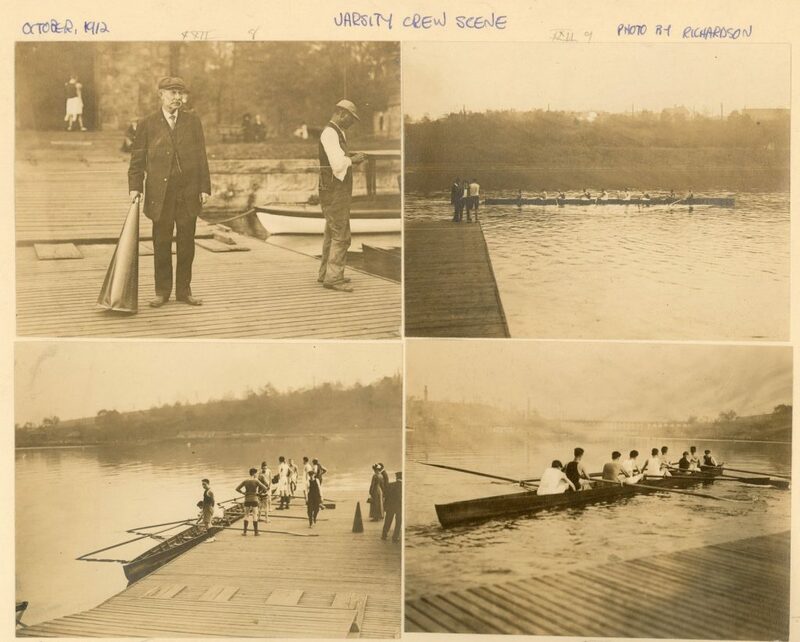 During the 1870s and 1880s Ellis Ward coached a number of non-collegiate boat clubs, including the Columbia Boat Club in Washington, D.C., the Fairmount Boat Club of Philadelphia, the Bohemian Boat Club of New York, and of course the University of Pennsylvania. In 1879, when Ellis Ward was thirty-three years old, he began coaching crew at Penn. His tenure lasted until 1912, with a few short breaks. In 1887 Ward resigned for the season because of controversy over the stroke he trained his athletes to use; a graduate student acted as trainer that year, but Ward was back the following season. Ward was also absent for a four year period from 1892 until 1895 when he trained rowers at the Manhattan Athletic Club in New York City. Ellis, an outspoken man who put the athletes in his charge through rigorous training, was not always popular. One example occurred in 1892. When he felt his best rowers were not putting forth their best efforts, Ward removed the entire varsity crew and substituted the second string of eight rowers. The substitutes won the college championship of America, on Saratoga Lake, but Ward’s decision was still controversial. This controversy may have had something to do with his departure from Penn at about that time. When the University began to take over the funding and oversight of Penn athletics, medical student George Woodruff became coach of both football and crew. But because Woodruff did not have enough time to supervise both sports, Penn rowers did not do as well competitively. As a result, Ward was hired by the University in 1896 and took Penn’s crew to a string of victories as well as a much-publicized 1901 trip to England to race at Henley. Yet, despite his many successes and his long tenure, Ward left his position as coach under the cloud of another controversy in 1912. Ellis Ward was one of the most prominent rowing coaches, if not the most prominent coach, in America during these years, with sixty-five victories to his credit. Ward’s coaching career at Penn reveals much about the development of college athletics in America. When Ward began as Penn’s crew coach, he was not employed by the University. The United States census for 1880, the year after he began coaching, lists him as living in Philadelphia with his wife Martha and three small children; his occupation is given as “oarmaker.” At this time the University provided no financial support for student athletics; there were no athletic facilities and no paid athletic staff. The College Boat Club and the Alumni Athletic Association, not the University, would have provided any funds to Ward during his first decade as trainer and coach. Coaching was just one manifestation of Ward’s dedication to rowing. As coaching positions ebbed and flowed, he maintained his craftsman skills and to those he returned at the end of his life. In 1910, when Ellis F. Ward and Martha Ward, plus her sister, were living near the Delaware River at 5924 Tulip Street in the Wissinoming section of Philadelphia, Ellis Ward had listed his primary occupation as coach at the University. In 1920 he and Martha were still living in the house on Tulip Street, along with their son Riddon H. Ward; the seventy-three year old father and the forty-two year old son both listed their occupations as oar-making. Ellis Ward died in his Tulip Street home July 25, 1922.